and Allianz to supply our Finnish data center with renewable energy for the next 10 years—our fourth long-term agreement to power our data centers with renewable energy worldwide, and our first in Europe. Here’s how it works: O2, the wind farm developer, has obtained planning approval to build a new 72MW wind farm at Maevaara, in Övertorneå and Pajala municipality in northern Sweden, using highly efficient 3MW wind turbines. We’ve committed to buying the entire output of that wind farm for 10 years so that we can power our Finnish data center with renewable energy. That agreement has helped O2 to secure 100% financing for the construction of the wind farm from the investment arm of German insurance company Allianz, which will assume ownership when the wind farm becomes operational in early 2015. This arrangement is possible thanks to Scandinavia’s integrated electricity market and grid system, Nord Pool. It enables us to buy the wind farm’s output in Sweden with Guarantee of Origin certification and consume an equivalent amount of power at our data center in Finland. We then “retire” the Guarantee of Origin certificates to show that we’ve actually used the energy. As a carbon neutral company, our goal is to use as much renewable energy as possible—and by doing so, stimulate further production. The Maevaara wind farm not only allows us to make our already highly energy-efficient Finnish data center even more sustainable, it also meets our goal of adding new renewable energy generation capacity to the grid. Of course, using renewable energy is good for the environment, but it also makes long term financial sense. That’s why, in addition to protecting ourselves against future increases in power prices through long-term purchasing for our operations, we also invest in new renewable energy projects that will deliver a return for our money. In recent years we’ve committed more than $1 billion to such projects in the U.S., Germany and, just last week, South Africa. We’ll continue to look for similar opportunities around the globe. 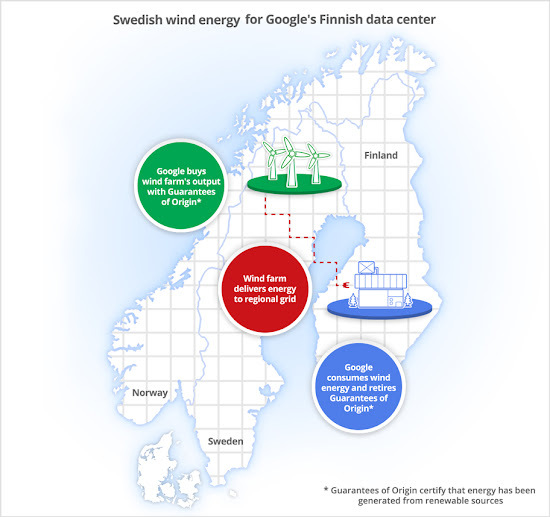 What do a Swedish wind farm developer, a German insurance company and Google’s Finnish data center have in common? As of today, a lot. 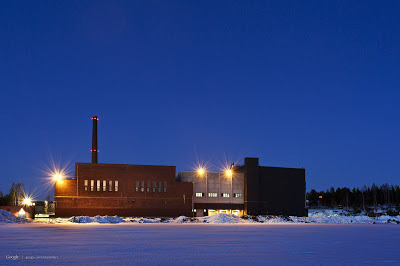 We’ve just inked agreements with O2 and Allianz to supply our Finnish data center with renewable energy for the next 10 years—our fourth long-term agreement to power our data centers with renewable energy worldwide, and our first in Europe.